I feel like I always hear from sports doctors and therapists that runners are the worst when it comes to taking time off to heal. I can't disagree because I might be the runner that made people think that. Ok, I'm not, but I can relate because I am exactly that way. I don't know what is so hard for runners when it comes to taking time off. For some reason we just really hate it. There are a lot of reasons for me to want to pick it back up right now even though I know I can't. Here are a few reasons I find it hard to take time off running. - I feel like I need cardio to have a good workout. You don't need to have cardio in order to call it a good workout. Strength training of any kind is awesome exercise. There are a ton of great workouts out there that aren't cardio workouts. But because I'm a runner and the majority of my workouts (all of my workouts?) have some form of cardio, it can be a little bit hard for me to let that go. - I feel lost when it comes to cross-training. Especially this time of year. When it's warmer outside I can justify a good walk with the kids as a workout, or playing at the park, or a bike ride. But right now none of us want to be outside and I don't have access to a stationary bike, the treadmill makes me want to run so I'm trying to talk myself into using the indoor pool and walking home in freezing temps afterward. Although I am sneaking in a little strength training along with all of the stretching and foam rolling too. - I feel my body getting weaker. This is just a game my mind is playing on me because you won't lose your fitness that quick. But my body feels lazier and weaker and I feel more bloated and I just don't like it. - I envy others who can workout too much. For example, my husband's work has an amazing gym that they can use. He gets a good workout every day that he's at work, and he goes to play basketball in the mornings. I feel so lazy! It makes me want to get moving. 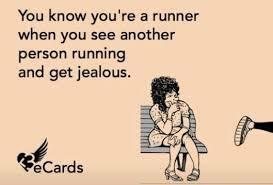 And when you see a runner outside?....Forget it! I die. This quote applies to me on a regular basis, but it's worse when I'm taking time off. - It's hard for me to see the numbers of my mileage getting smaller than normal at the end of the day. I'm used to having lots of miles added up by the end of the day but right now I'm lucky to get 2 miles by the end of the day. - Thinking about upcoming races and my race goals make me antsy to get back to work. I've made sure to give myself enough time to be ready for my race when I can get back at it but right now it feels I'll never be ready. If you're a runner who has taken a break for any reason, especially for recovering from an injury, you'll understand all of this! So to the doctors who have to deal with us: we are sorry! We are trying to get better, we just don't like the feeling of taking time off. What is the longest you've had to take off from running and why? What is your least favorite thing about a break from your normal workout? What is your favorite way to keep yourself sane when you can't workout? I am only two weeks post-op and am ITCHING to get back to running. It really is hard to take time off! Right?! It’s really snowy and cold where I am right now so at least it’s not super appealing to go out on a run. I hope you find something to distract you from how much you want to run today!